Pea protein is a plant based ingredient that allows a baker to increase the protein content of breads and other baked goods. 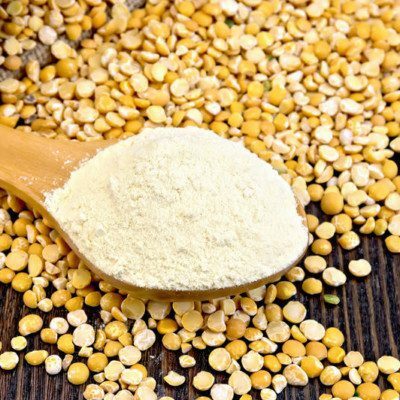 It is extracted in concentrated or isolated form from fine milled yellow pea flour. Peas are part of the legume family and considered a pulse. Pulses are crops harvested solely for the dry seed and do not include crops harvested green, such as green peas.2 Other pulses include chickpeas (garbanzo bean), lentils, lupins, kidney beans and faba beans. Pulses have been an essential part of the human diet for centuries. Protein is evaluated for quality, including amino acid composition as well as the ability of the body to utilize it. The United States uses the PDCAAS (Protein Digestibility Corrected Amino Acid Score) to evaluate protein quality. Pulses, such as peas, are better sources of protein than cereals like wheat, barley and quinoa. Combining grains and pea proteins can increase PDCAAS. Pulses are known to contain anti-nutrients which can limit the digestibility and nutrient absorption of proteins.5 Isolates, because of the way they are processed, have less anti-nutrients. Dry Separation: Utilizes the different densities of the pea flour components to separate the particles and increase protein content. For example, pea flour is passed through a spiral air stream in order to separate the coarse starch particles from the fine protein particles. Peas are an exceptional source of protein, but can have a beany, earthy, bitter flavor that is oftentimes undesirable.1 Some manufacturers have developed processes to de-flavor pea proteins. Pea protein has emulsifier characteristics and can function as a vegan alternative for eggs in recipes. Additionally, pea protein will not lose structure functionality under high temperature. Nosworthy, M.G., Tulbeck, M.C., House, J.D. “Does the Concentration, Isolation, or Deflavoring of Pea, Lentil and Faba Bean Protein Alter Protein Quality?”. Cereal Foods World. 62:4, 2017, pp 139-142. FAO. Pulses and Derived Products draft. Definitions and Classification of Commodities, 1994, http://www.fao.org/es/faodef/fdef04e.htm#4.02, Accessed on 7 December 2018. FAO. Pulses: Nutritious Seeds for a Sustainable Future. 2016, pp 24, http://www.fao.org/3/a-i5528e.pdf, Accessed on 7 December 2018. Pulse Canada. Protein Quality of Cooked Pulses. http://www.pulsecanada.com/wp-content/uploads/2017/09/Pulses-and-Protein-Quality.pdf, Accessed 7 December 2018. Cassiday, L. Pulses Rising. American Oil Chemist Society. 2018. https://www.aocs.org/stay-informed/read-inform/featured-articles/pulses-rising-april-2018, Accessed on 7 December 2018. Northern Pulse Growers Association. Pea Protein. https://northernpulse.com/uploads/resources/658/pea-protein-brochure.pdf, Accessed 7 December 2018. U.S. Food and Drug Administration. “GRAS notices” accessdata.fda.gov. https://www.fda.gov/Food/IngredientsPackagingLabeling/GRAS/NoticeInventory/ucm495404.htm, Accessed on 7 December 2018. Why Should You Replace Eggs in Baking? How Sweet it Is: An Emulsifier for Your Cakes! Propylene Glycol: Should it be in your baked goods? Is Your Palm Oil Sustainable?